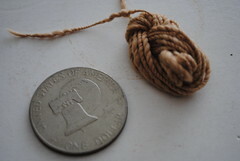 Today, for the first time, I was able to work with my Fast Flyer to make some fine yarn and to try my hand at cotton. Let me tell you something about cotton my friends, is a lot of work. I can see how a Charka may be a better choice, but like everything you have to learn how to spin cotton with lots of patience. I may try some other day using my spindle. I may just keep on trying until I get it , cotton has a very short drafting zone, and it requires a lot of work. 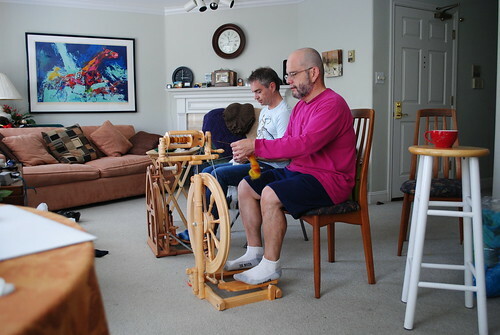 I did get to use my Fast Flyer to try some other spinning , I will have to practice some more and see what happens. The yarn above was made using the fast flyer. The fiber was dyed as roving and it was not done very well . I cooked the fiber too long before I learned how to do it properly or rather better. It is nice roving to practice drafting and also worked well with my hand cards as I did some color blending that was very nice, the rolag below is one of the blends of red and yellow. The yellow-blue, the blue - red , were two ply. 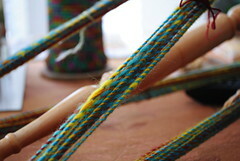 The red -yellow by itself was Navajo plied, which means it gets 3 strands of yarn. It was fun and it was practice. I got a visit from my friend to spend some time spinning with me. We talked and listened to music, had tea and some cookies. This is it for today until next time, thanks for stopping by.